If you are using v2, please use the following link: Calendar Module Guide. The Calendar Module is a feature that is designed to pull in data from an iCAL feed to display in Layouts. This tutorial will walk you through the process of how to produce a Layout that will show information held in a calendar which supports the iCal format. This feature is available in the Xibo CMS 1.8.10 release or later. 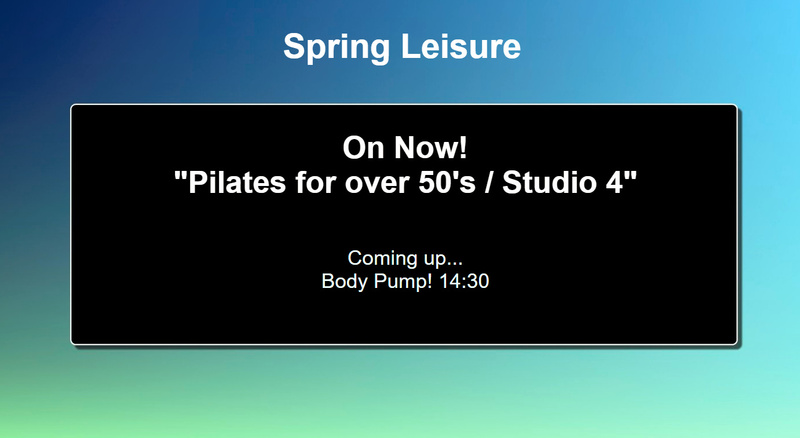 With a huge variety of available iCAL feeds and many variations of how this module can be utilised in Xibo, I am going to use Google Calendar with scheduled events for my fictional Leisure Centre ‘Spring Leisure’ so I can include an iCAL URL to demonstrate how useful and easy this new Widget really is! Use the text editor to include your own text as well as using the text fields under Available Substitutions, double-click to select. I have used substitutions ‘Summary’ and ‘StartDate’, as well as my own text, as I want to display the name and time of upcoming events. Resize, position, colour etc to make the text look attractive in the Layout. Tick in the ‘Set an alternative template for events that are current?’. Ticking this box will tell Xibo to use your Players Date/Time to work out if the event showing is current. This will also present an additional text template giving you the option to include text, type in tags and format for your ‘current events’. Update interval - 60 mins. This means the Widget will check for new entries in the iCal feed every 60 minutes. Enter a message, using the text editor, to display a message when there is no information returned from the source so that your audience is not left with a blank screen. Your Layout will show your updated information. Preview your Layout by using the Actions tab to see the information displayed as included in your chosen calendar. Layouts can now be scheduled as normal to be shown on your chosen display/display groups! And tested it this morning with a shared calender in my iCloud. It starts with “webcal://p26-calendars.icloud…”. I got an error and did some research and tried the same url but with “https://p26-calendars.icloud…” and it works. So if someone needs it too, try it like this example. Is this live in the current release? I have 1.8.10 running and I don’t see the calendar option for layout. Looks like an awesome tool! Yes, but you will need to install it first. Please navigate to the Modules page in your CMS, click on the install modules button and install the Calendar module (and any other module you’re missing and want to use). Ah found it. Thank you!! Any idea why I might get a Configuration Error “unable to download to download feed”. I am trying to use a google calendar. I tried both the Private, and the Public (after changing sharing settings to public). I followed the settings above to get me started and all it will get me to is the Configuration Error in the region I am trying to get it to display in. Interesting, could you please create a separate topic in Support category describing the problem? If you could also mention in your topic if that’s docker or manual installation please? You can PM me your ics feed URL if you wish and I will check it, but all of the ones I’ve been sent so far work perfectly. The issue is that you have no merge fields configured in your widget, or no time period over which the widget should search defined.